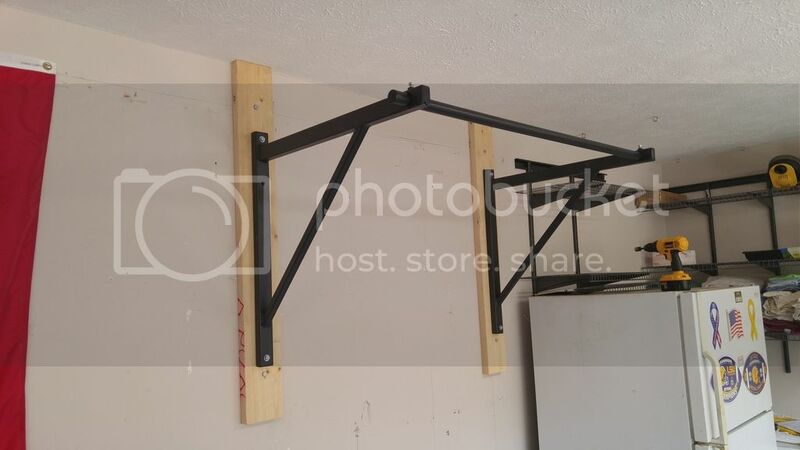 As I've mentioned before the box I was doing crossfit at for just a short 5 months last year closed it's doors in early December, prompting me building out my garage gym. 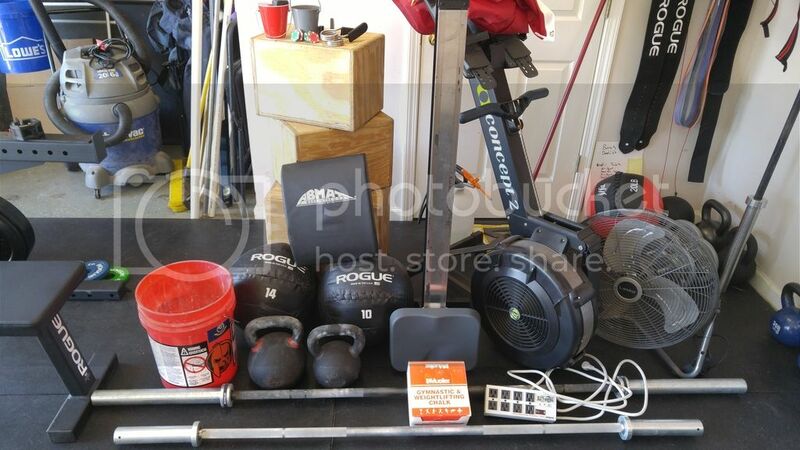 They are selling off equipment at seriously discounted rates this weekend and I was able to pick up a few things this morning after doing 16.1 at another box about 20 miles away. I actually only went to pick up the C2 Rower they owed me but ended up picking up quite a bit more than planned as I couldn't pass up the prices, plus it was painful watching what she has gone through trying to keep the business going so some of this stuff I took just as an excuse to give her more money to help her pay all the debtors she has right now. Happily was able to retrieve the Marine Corps flag I donated to the box also. 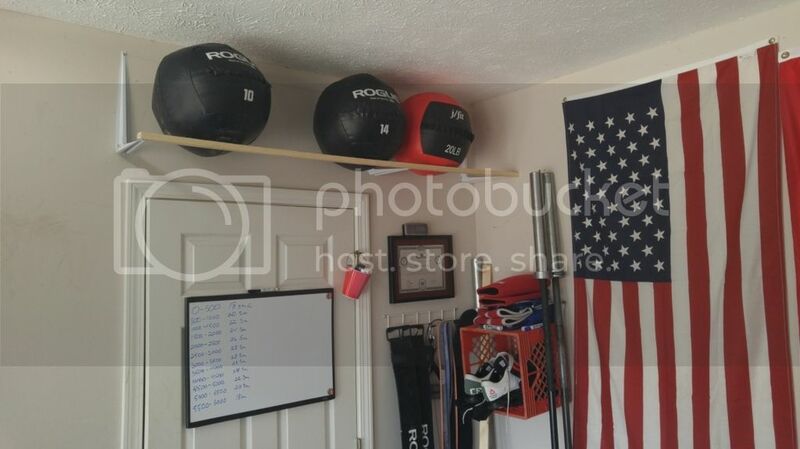 The technique bar and the smaller plyo boxes are my attempt to get the wife out in the garage with me to let me teach her how to lift. We'll see if my alterior motives play dividends in the long run. "Hey all you Vegetarians.... My food poops on your food." Its a shame when a friend is in need but dude that is a nice score good luck with getting the wife to join you. Shame about the box going down, but good haul. I purchased a few things with the same intent of getting the Mrs out there. Only had a few cameos so far but working on more? Nice equipment!! and you also put it to good use! Finally added a couple of things I've been meaning to do for a couple months now. Also, finally put up the gun racks for the bars. Bought it back in January when I only had the 2 bars, the cheap one and the Lynx hibrid bar. 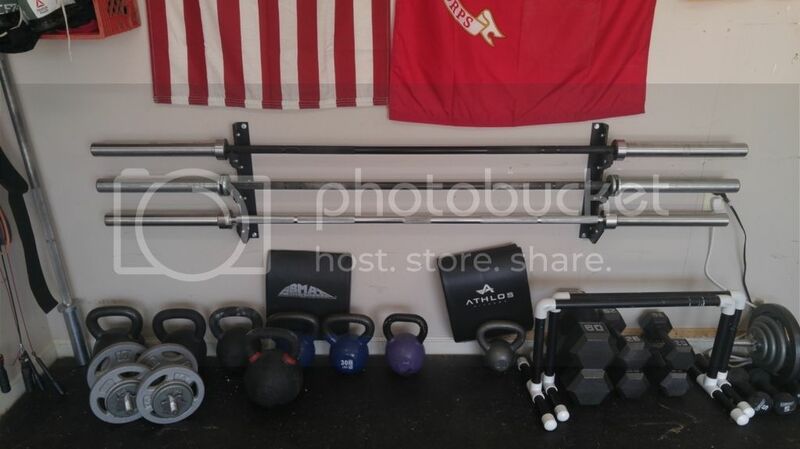 Didn't realize I'd be adding the Rouge Bar and the 15lbs training bar in Feb when the box sold the equipment or I'd have gotten the 5 bar gun rack. Oh well. Just now seeing this. This is so awesome! this is better equipped then most commercial gyms - simply awesome! 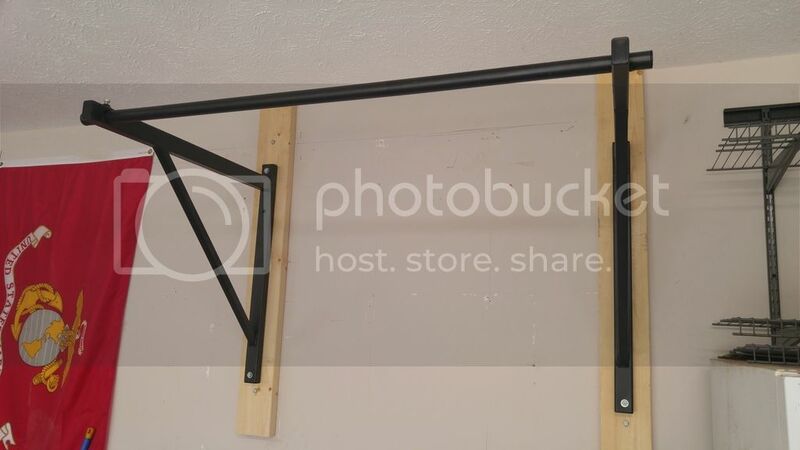 Anyone looking for a wall mount pullup bar head on over to Titan Fitness. I ordered this one on Sunday afternoon and it was sitting on my doorstep on Tuesday when I got home from work, free shipping to continental US. Outside the US call them about shipping. $89 and that price just went up from the first time I almost bought it back in January of $75. Still a lot less than any system being sold on other sites. Very nice indeed. And that explains the pull-ups of death, or whatever you called that crazy progression of pull-ups that you did tonight. LOL! Like a kid at Christmas. Couldn't wait to get out there and break it in! how do you like the stall mats for powerlifting? any big difference for you compared to concrete or other hard surfaces? Like them just fine. You can feel the difference from lifing off of a concrete floor. However in humid conditions they do get slick just like the concrete will so I have to keep a fan blowing across it when the weather gets like that.